Dr. Brad Rosenheim discusses the threat of sea level rise at Taste of Science. ST. PETERSBURG, FL – What do mangroves, mud, and Antarctica have to do with St. Petersburg? This is a question Dr. Brad Rosenheim has been pondering for many years. 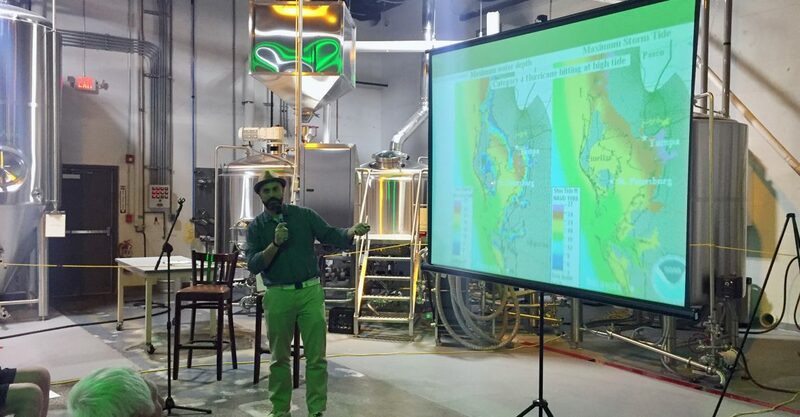 He shared his insights at the taste of science event on October 18, 2018, which brought in nearly 70 people from the St. Pete community to Flying Boat Brewing for a trio of talks. He discussed how melting Antarctic ice sheets lead to higher sea levels, while mangroves provide an unexpected environmental benefit, sucking carbon dioxide out of the atmosphere and storing it in soils for long periods of time. Taste of science, a national non-profit organization, is dedicated to bringing scientists out of the lab to explain their work in plain English, to an interested, non-scientist audience. The College of Marine Science was especially integral to this effort. In addition to a talk given by Dr. Brad Rosenheim, Dr. Maria Vega-Rodriguez, a CMS grad, spoke about wastewater treatment in Pinellas County. The event was organized by Ben Prueitt, a member of the C-IMAGE group, with the help of Carey Schafer, a current CMS graduate student. Numerous students and staff attended the event. Events such as these highlight the vital role the college plays in community outreach efforts.